SOUTH AFRICA’S MISERABLE tour of the northern hemisphere came to a fittingly disappointing end on Saturday, as Wales won 27-13 at Principality Stadium. The victory for the hosts in Cardiff, just their third in 32 meetings with the two-time world champions, may have come at a cost to Rob Howley’s team, though, with flanker Dan Lydiate, in for the injured captain Sam Warburton, stretchered off at half-time after suffering what appeared to be a potentially serious knee problem. Having failed to give retiring captain Adriaan Strauss a winning send-off in his final match, the Springboks have considerable soul-searching to do, another defeat coming after they gave up their long unbeaten record against England and then suffered a first Test loss to Italy. South Africa did take the lead through an Elton Jantjies penalty in the seventh minute, Tomas Francis deemed by referee Romain Poite to have dropped a knee in the scrum. But the inconsistency and lacklustre play that has plagued the Springboks during this tour became prevalent again as the half progressed. Mistakes from the likes of Ruan Combrinck and Nizaam Carr allowed Leigh Halfpenny to send over four penalties, with only a Ken Owens infringement affording Jantjies an opportunity to keep South Africa in touch, as Wales went in 12-6 ahead at the break. Things did not get better for the Allister Coetzee’s team early in the second half, as Faf de Klerk was sent to the sinbin for a deliberate knock on and Halfpenny gratefully accepted the invitation to extend the home team’s advantage. Such was the shambolic state of the Springboks’ handling, another ruck infringement moments later saw Wales kick for touch, win the subsequent lineout and drive for the line, Owens going over to score the first try of the match, although Halfpenny failed to convert from out wide. South Africa, invigorated by a host of substitutes, threatened to capitalise on Wales’ failure to make the result safe, winning a lineout and driving over powerfully for Uzair Cassiem to touchdown. Pat Lambie converted to get his team back within touching distance with nine minutes to go, but there was no way back from Justin Tipuric’s 76th-minute try, converted by Halfpenny to restore some gloss to the scoreline for Wales. Email “Dan Lydiate injury sours dominant Wales win over South Africa”. 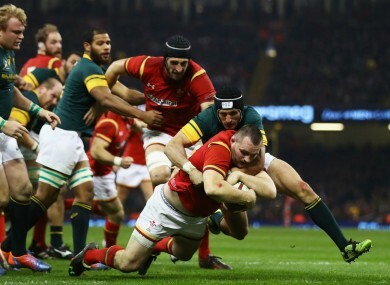 Feedback on “Dan Lydiate injury sours dominant Wales win over South Africa”.